Since 1898 Cidrerie Ruwet is a producer of craft apple cider. At Ruwet they only use 100% apple juice, freshly pressed in the morning and fermented at noon with fresh, organic yeast. This company is 100% Belgian and only uses Belgian apples and produces cidre in a traditional and authentic way based on it’s 100 year experiences. 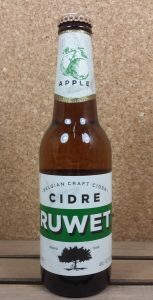 Cidre Ruwet is the alternative for a consumer who is looking for authenticity, craftsmanship and quality. A natural apple cider, medium sweet 4.5% ABV. An excellent thirst-quencher for the Summer. Perfect Draft Tapping System from Phillips. The customised solution for your favorite Belgian beers on draught from Belgian brewer ABInBev. Perfect Draft tapping system is easy to install; just plug in and play. or as a seperate tap at pub or restaurant. 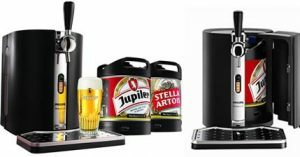 Check Belgiuminabox.com for available kegged beers from ABInBev, like Hoegaarden (Wit & Rosée), Leffe (Blonde, Brune, Ruby, Rituel, Royale), Jupiler and Stella Artois. Hoegaarden Witbier-Blanche and Hoegaarden Rosée are famous for being ideal thirstquenchers in Summer time. Hoegaarden beers are still being brewed in the Belgian village of Hoegaarden and are part of Belgian brewer ABInBev. Both brews are also available in kegs of 6 litre from the well-known tap-installation Perfect Draft from Phillips. What better way to enjoy Hoegaarden on parties, BBQ, or even company events ?? 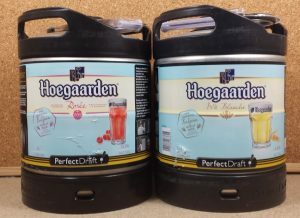 Belgiuminabox.com can now accomodate you with the Hoegaarden 6 L Kegs Perfect Draft. Check out our selection in the shop of kegs here. As our regular customers know, Belgiuminabox has been with Bpost since we started shipping boxes for our online beer-shop. With larger volumes come better prices, thus we decided to start contacting shipping carriers to check if there were savings to be made. After long negotiations we managed to reach our set up goal with our new shipping partner; DPD. With this change of ‘shipping partner’ comes better pricing, up-to-date customer service of Estimated Time of Delivery (ETA) and quicker delivery. Tracking mails will have a new look and DPD does the ‘Track & Trace’ communication and the final follow-up till the delivery of the box(es) to your doorstep. To avoid all confusion; DPD already carried out the delivery of the boxes for most of BPost’s European shipments, but did so as a sub-contractor. DPD relies on a very extensive and fully developed network for their deliveries across Europe. Belgiuminabox is happy to work together with DPD on a direct basis for all of our European shipments !! Check out the new shipping fees for your country per weight/box of 31.5 kg. Some countries have their shipping fees reduced by over 50% ! Note: These fees apply for 2016 and may alternatate in the future. If you have any more questions regarding shipping, be sure to send us a message.